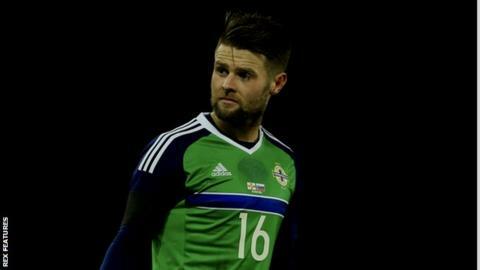 Reading's Oliver Norwood believes Northern Ireland will continue to fly under the radar at Euro 2016 - their first major tournament for 30 years. Norwood, 24, insists Michael O'Neill's side, who are unbeaten in 10 matches after Monday's win over Slovenia, are continually underestimated. Northern Ireland will face Poland, Ukraine and Germany in Group C in France this summer. "We are not going there to make the numbers up," Norwood told BBC Sport. "The lads were saying that we have had not much recognition for what we did achieve. I think it's worked in our favour a little bit to be honest because people do underestimate us a bit and it's worked out for us. "I think we do surprise a few teams because of how good a team we are. But we've earned the right to take part in the tournament and we know what we are good at and that we can achieve good things." Norwood has established himself as a regular starter alongside captain Steven Davis in Northern Ireland's midfield. But he believes that he, along with Reading team-mates Paul McShane, Chris Gunter, and Hal Robson-Kanu, must maintain their club form to ensure a seat on the plane to France. Gunter and Robson-Kanu have respectively earned 66 and 30 caps for Wales, while McShane has played 31 times for the Republic of Ireland, both teams also Euro 2016 qualifiers. Reading have not won any of their last five matches and are only eight points above the Championship relegation zone. "If you are not doing well at your club and not playing then it gives the international managers a decision to make," Norwood added. "You do not want him to be making the decisions and then not make squad for the finals. It's important to get back in the team here [at Reading] as quickly as I can and play well until the end of the season. "We have got to start picking up points, we do not want to be getting drawn into the bottom of the table. We are only eight points off it and we know we are not safe yet."